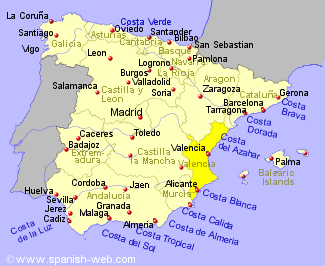 Valencia incudes Alicante, Valencia and Castellon often grouped with Murcia and referred to as the Levante. It is known for the orange growing areas as well as peaches, apricots, grapes, grapefruit and many more. Also for the production of some wonderful vegetables such as green beans, broad beans, peas, and tomatoes. 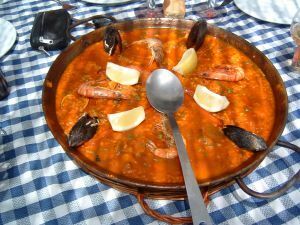 Valencia is the home of the famous Paella and other rice dishes including Arroz a Banda and El Caldero. There are also some famous fish dishes in this area which includes Dorada a la Sal, bass baked in salt and grey mullet. Other specialities are cured fish, Mojama and Giraboix which is a salted cod stew. Castellon has superb Langastinos which are big prawns and also Robellons, a wild mushroom the colour of ochre. Alicante offers a little of everything including Turron which is almond nougat and very popular at fiestas and Christmas time.